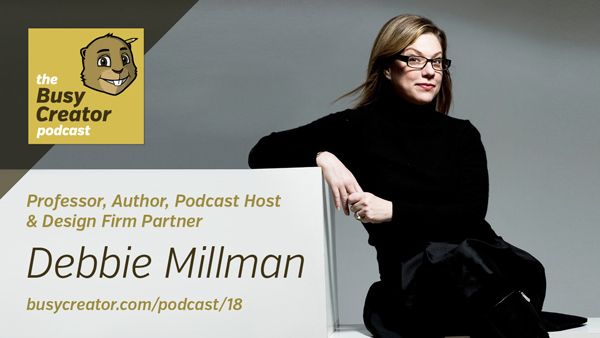 Debbie Millman (@DebbieMillman) is a design and branding industry impresario. She will, at any given moment, be involved in a multitude of projects and roles across the profession. For nearly 20 years, she’s been the President ofSterling Brands, a design and brand strategy firm based in New York, Los Angeles, and San Francisco. Since 2005, she’s hosted Design Matters, one of the most successful radio shows (now podcasts) about design and creativity. She also founded and chairs the Master’s in Branding course at theSchool of Visual Arts in New York, and has authored numerous books. In this episode, Debbie speaks about the structure and workflow of Sterling — now a corporate agency, how she stays energized across her many endeavors, and how she’s still working to overcome awkwardness in her life and career. We also get to hear the story of how Debbie and Prescott first met. Prescott discovered Design Matters while working a crappy job working for a startup marketing firm. Sterling acquired Philippe Becker in San Francisco, joining that to their studio. Simon Lince is Sterling’s Chief Creative Officer in New York, with four Creative Directors under him. Same with Philippe Becker in SF. Sterling consciously went to the traditional advertising agency model, rather than a “bullpen” model, with lots of cross-disciplinary work. It was “less deliberate”. “Institutional knowledge” is important for growth within an agency. Helps to serve clients year-on-year. Design strategy entails asking questions: What is the brand? What is the criteria for success? What is the “whitespace” we want to uncover? Can we own that space? What is the dynamic for change within an organization? etc. Package design is a “very specific language.” One must know the grammar of a language, but not necessarily all the dialects, which are learned on the job. Design Matters is a cultural force, whether Debbie thinks it or no. Energy management is more important than time management. Prepare strategy and challenges during proposal/pitch stage. Don’t wait until you’ve won it. Want something done? Ask a busy person — they have less time to procrastinate. Learn what you’re good at. Production/details? Coming up with ideas? Sleep a lot. 8 hours at least.